When can we take our baby outside? 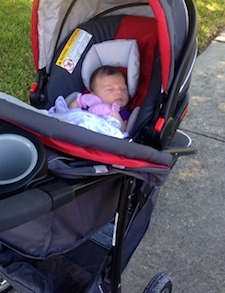 You mention on your website about trying not to take the baby outside the house to public places before she gets her shots at 2 months…is it ok to take her on walks in a jogging stroller, around my neighborhood? Fresh air is good for both babies and parents. Newborns can be taken outside immediately after leaving the hospital. Parents should not expose their child to direct sunlight or extreme temperatures. In general, children are most content at temperatures that make their parents comfortable.